Long running band fronted by Brian O'Reilly. 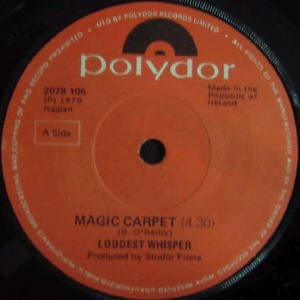 Loudest Whisper grew out of an earlier band called The Wizards, who were active in the Fermoy area for a number of years during the 1960s. 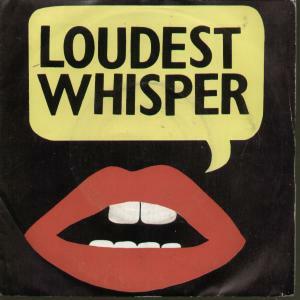 The final Wizards lineup became Loudest Whisper ca 1970. 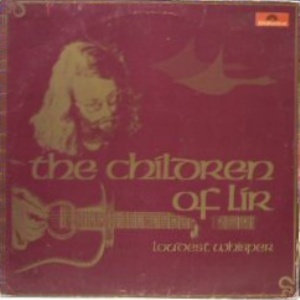 The name was chosen to reflect their attempt to mix folk with the heavy music of the day. 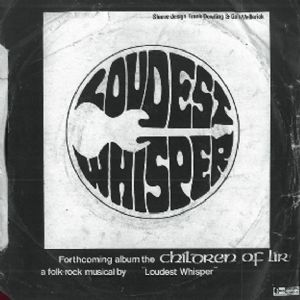 Loudest Whisper are most famous for the "Children of Lir" folk rock musical, which was first performed on the 7th January 1973 in Fermoy. 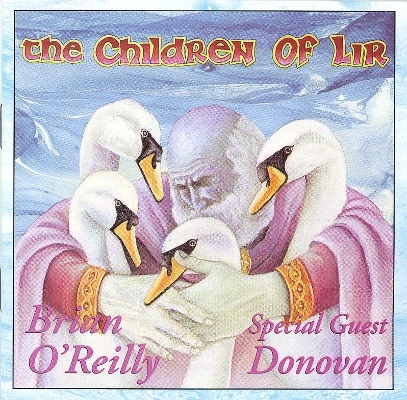 "Children of Lir" combined American/West Coast folk rock with Brian's interest in musicals and Irish folklore. The results far exceeded everyone's expectations and the musical was soon on the road, playing to larger audiences. It received further exposure through a segment recorded for Tangents, a magazine-style current affairs TV show on RTE, which followed the main evening news. Spurred on by this success, Brian wrote a second musical "Perseus" which featured new singer Geraldine Dorgan, who was still at school. 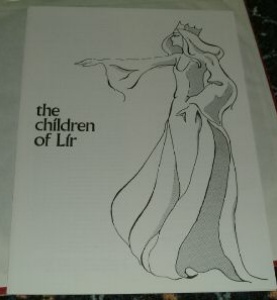 "Perseus" premiered at the Fermoy Youth Centre during Christmas 1973. RTE filmed a 20 minute TV special on "Perseus" but managed to loose the footage before it could be screened. 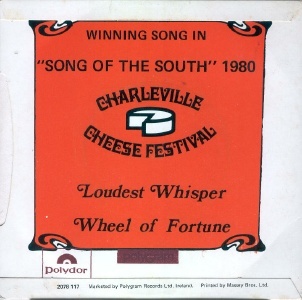 It was revived in April 1979 by students at Chanel College Coolock in Dublin. 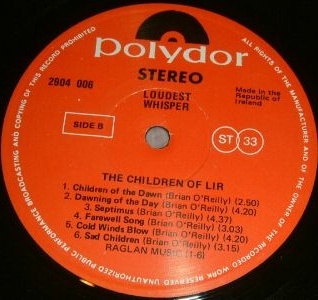 The success of "Children of Lir" inevitably led to record label interest and Loudest Whisper were signed by Polydor Records. 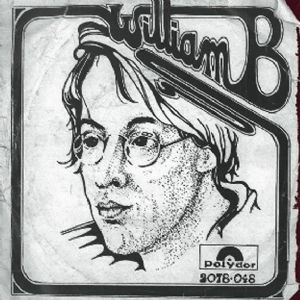 The band recorded their debut single "William B", a tribute to W.B.Yeats, and began sessions for recording "Children of Lir", with Leo O'Kelly in the producer's chair. This proved to be a long, drawn-out process as it had to be done over many weekends. 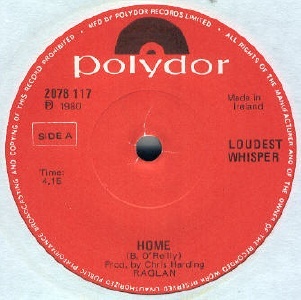 Ron Kavanagh, who sang the lead role in the original state production, left the band during these sessions. Brendan Neligan also left, preferring the bands earlier, less folky sound. 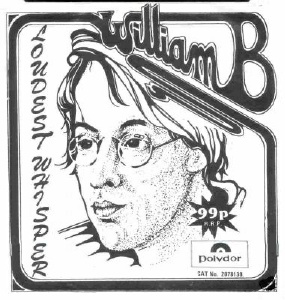 "William B" had to be re-recorded when the W.B.Yeats estate objected to a quotation used in the original version. 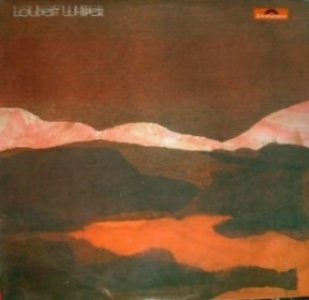 It was finally released in 1974. 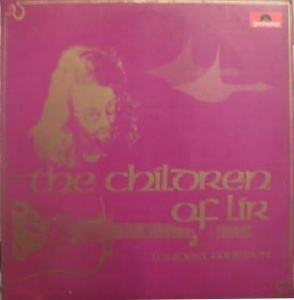 The release of "Children of Lir" appears to have been downgraded after Polydor UK's lukewarm reaction to the album and Polydor Ireland's subsequent loss of enthusiasm for the project. 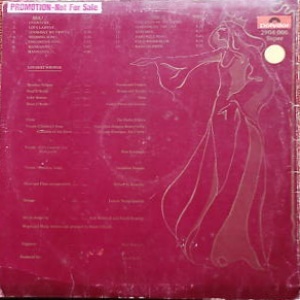 Nowadays, it'is considered a folk rock classic. After it's release, Geraldine Dorgan who by then had finished school, became a full-time member of the band. 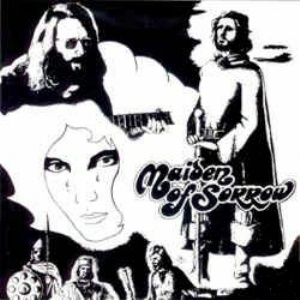 1975 was taken up by a third musical, "Maiden of Sorrow". 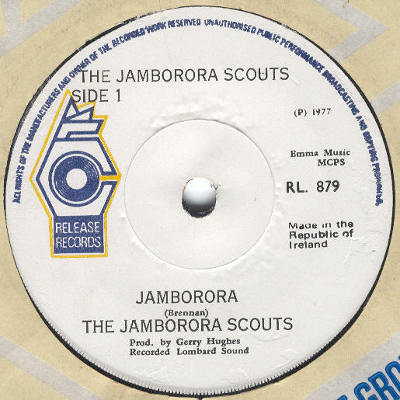 This was never recorded in a studio (shame on you Polydor!). 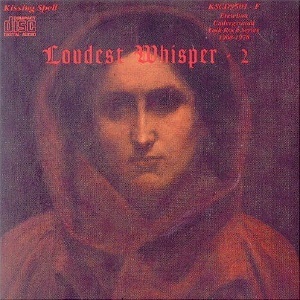 If you want to hear it, you'll have to track down the Kissing Spell CD issue of a bootleg live recording. 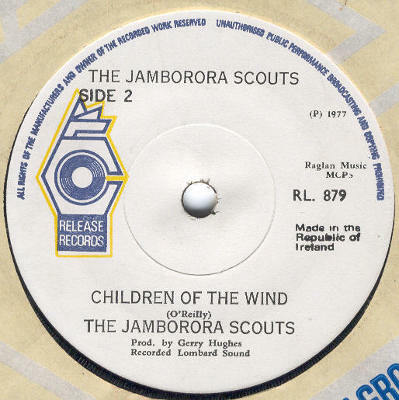 During 1976-77 the band scored a couple of hits in Ireland. John Aherne left in 1977, unable to balance live work with his day job. 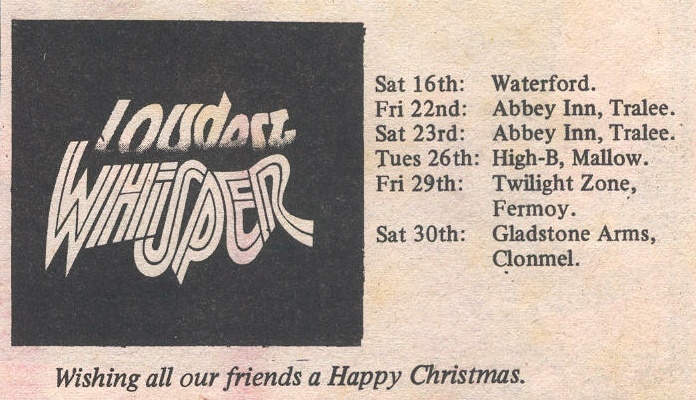 In 1978, work began on building a recording studio in Fermoy. 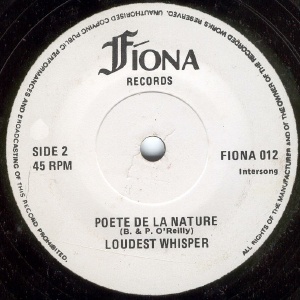 Fiona Studios was a joint venture between Brian O'Reilly and a local music shop. It opened it's doors in 1979. 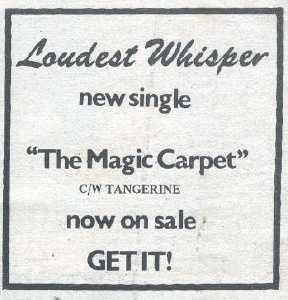 Loudest Whisper had another hit the same year with the autobiographical "Magic Carpet Ride". 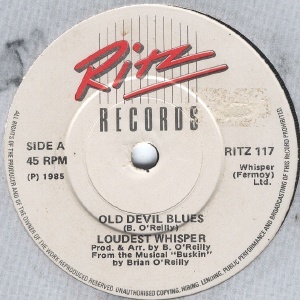 In the late 70s, Brian O'Reilly wrote the soundtrack music for a short Frank Morgan film titled Old Grumpy And Mary B. 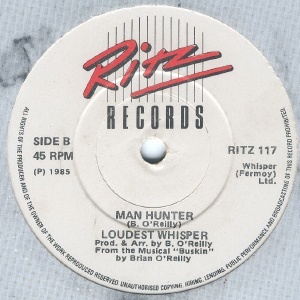 The music was performed by Loudest Whisper. The production date of the film is unclear: different sources list it as 1975, 1977 (BFI), and 1979. In 1980 it was re-edited and submitted for the Daily Mail Challenge Trophy for the Best Amateur Movie of the Year, which it won. 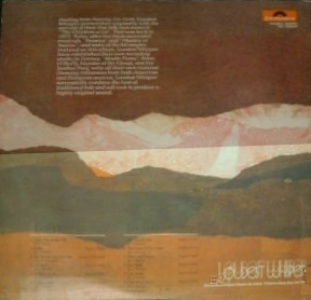 The soundtrack is unreleased. 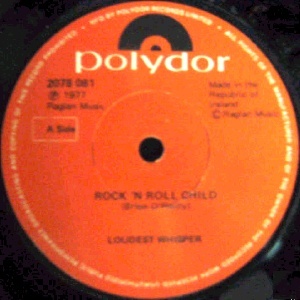 In 1980, Polydor agreed to a second album, as long as it included the hit singles. 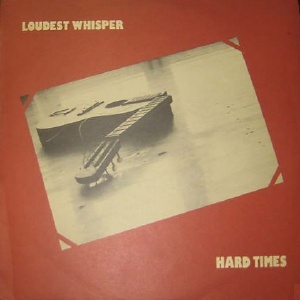 The third album "Hard Times" (November 1982) featured Brian O'Reilly on bass, John McGrath on lead guitar, and new co-lead singer Bernadette Bowes. 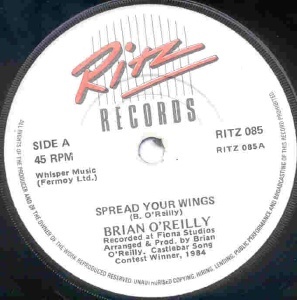 By 1985 a new lineup was performing a new musical titled "Buskin'", which played in Cork and London and was a stage success but was alas unrecorded apart from "Spread Your Wings" which was issued as a single. 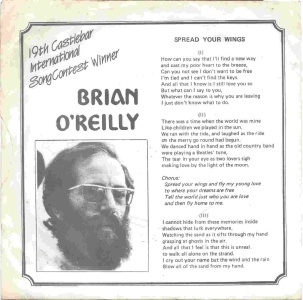 This band included the O'Reilly's plus Orla Gowen (vocals), Ernie Touhig (lead guitar) and Harry Corneliusson (bass). Ernie Touhig suffered a serious accident which puts things on hold. 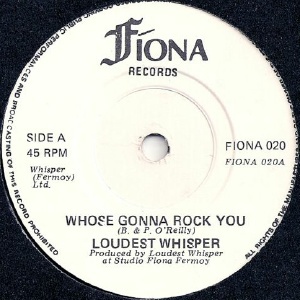 Other musicians who played with Loudest Whisper include Mike Russell, Mo O'Connor (slide guitar on "Satisfaction") and bassist Chris Hurley (also in Discovery/Driveshaft). Ron Kavanagh suffered a serious accident in September 1973, touching a live microphone and then falling, fracturing his skull. 500 copied pressed according to rumour/legend, but this is undocumented. Entered the Irish charts, peaking at #7. 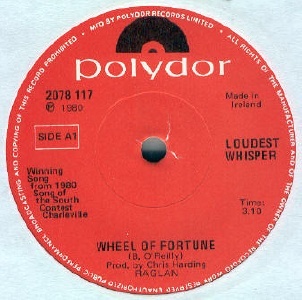 Entered the Irish charts on 22.10.1976 for a 9 week run, peaking at #4. 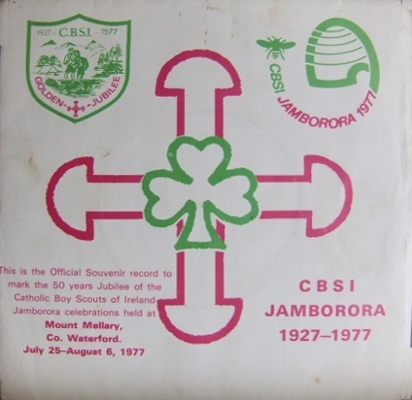 Official Souvenir marking hte 50th Anniversary of the Catholic Boy Scouts of Ireland. 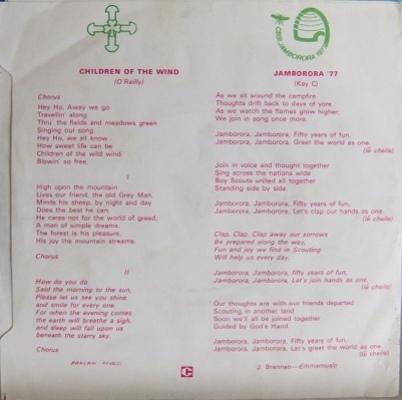 Children of the Wind written by and featuring Brian O'Reilly. 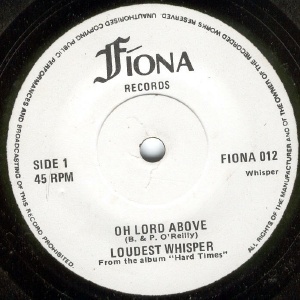 Entered the Irish charts on 22.03.1979 for a 5 week run, peaking at #15. 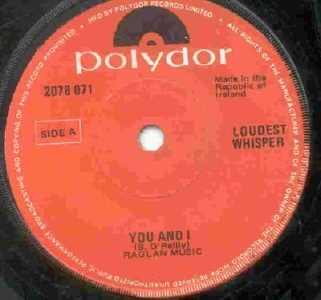 Entered the Irish charts on 19.07.1979 for 1 week, peaking at #28. 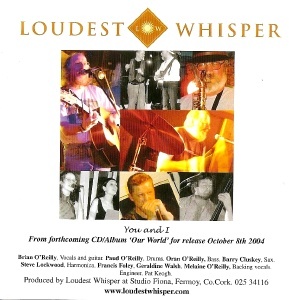 CD - Kissing Spell/Erewhon - KSCD 9501 - UK - 1995 - as "Loudest Whisper 2"
Original LP Liner Notes: Hailing from Fermoy, Co.Cork, Loudest Whisper proved their originality with the success of their first folk rock musical "The Children of Lir". That was back in 1973. 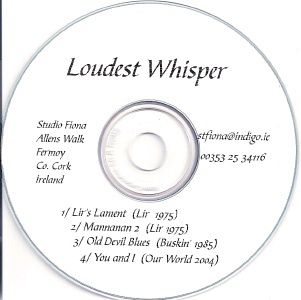 Today, after two more successful musicals "Perseus" and "Maiden of Sorrow", and some of the hit singles featured on this album, Loudest Whisper have established their own recording studio in Fermoy "Studio Fiona". 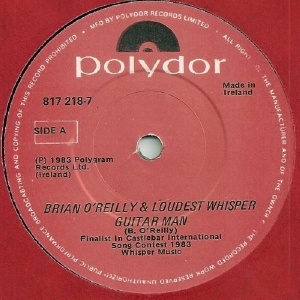 Brian O'Reilly, founder of the group, and his brother Paul, write all their own material. 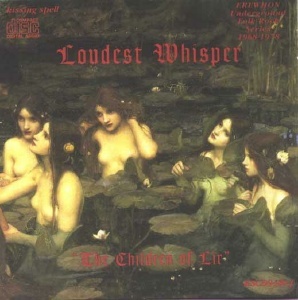 Drawing influences from both American and European sources, Loudest Whisper successfully combine the best of traditional folk and soft rock to produce a highly original sound. 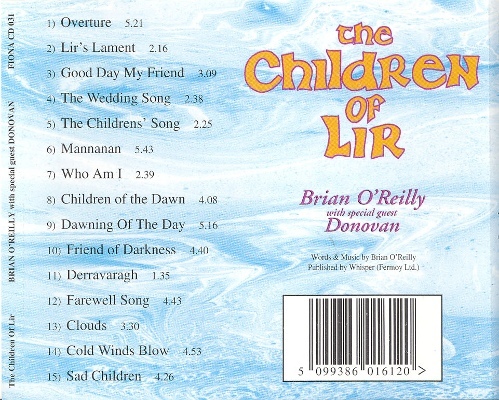 "Cold Winds Blow" is a re-recording of the Children of Lir track. 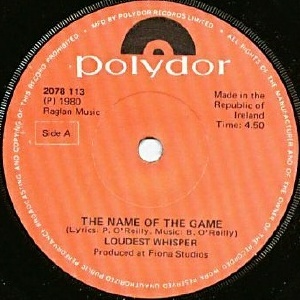 "Name of the Game" is Part 1 only. The Kissing Spell CD resequences the original LP running order for no good reason. Not 2078 187 as previously reported. 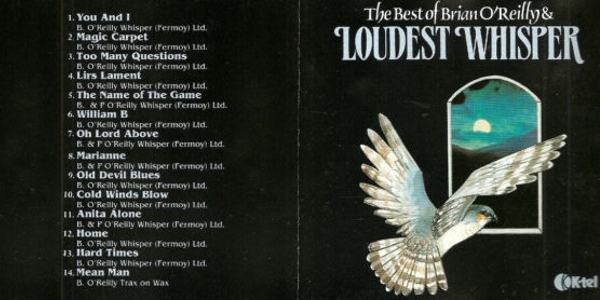 At first glance this is a best of selection, but these are new, re-recorded versions made by the early 90s lineup of the band: Frank McClellan (vocals), Brian O'Reilly (guitar), Johnny Campbell (bass) and Paud O'Reilly (drums) lineup. 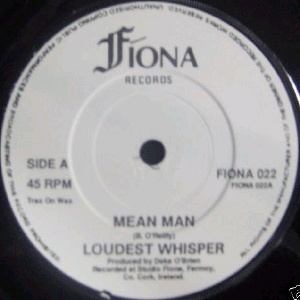 As such, it's actually Loudest Whisper's fourth album. 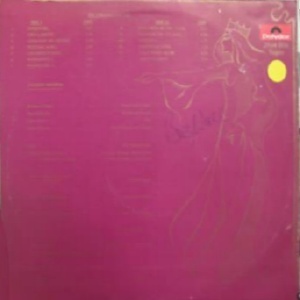 The project was arranged with the band's new label K-Tel Records, and "Too Many Questions" was earmarked as a single, but by the time of release management at K-Tel had changed and there was no attempt to promote the album. 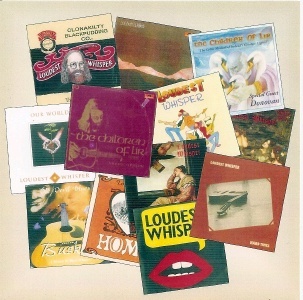 K-Tel were unwilling to return the rights to the band, and so "The Collection" remained hard to locate until a second issue was arranged, sponsored by the Clonakilty Black Pudding Co whose CEO was a longtime fan. The K-Tel was not withdrawn but it was not promoted and is hard to find. The blurb... "This collection is representative of the coming together of two great Irish traditions, music and food. It is the ultimate statement of 25 years of musical magic bringing together the finest ingredients of folk and rock. 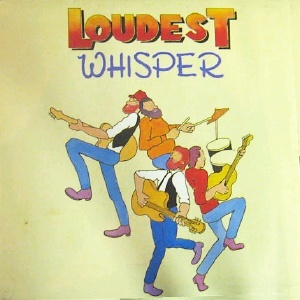 Loudest Whisper are long established as a highly creative and original band with their own blend of folk/rock music." ...of course, all that black pudding clogging up your arteries is not really good for you! 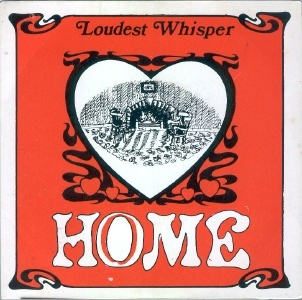 4-track CD single issued to promote the release of The Collection in an identical cover. 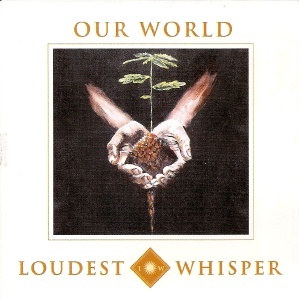 Promo only one track CD single issued in anticipation of Loudest Whisper's first new album in many years "Our World". 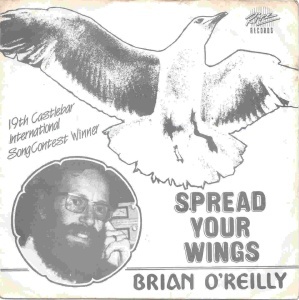 The band lineup is Brian O'Reilly (vocals andf guitar), Oran O'Reilly (bass), Paud O'Reilly (drums), Barry Cluskey (sax), Steve Lockwood (harmonica), plus backing singers. 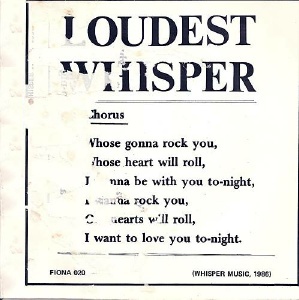 Originally known as "1999 And Beyond", a CD of demos circulated to friends and relations of the band as a means of drawing up a shortlist for the next album . . . which appears five years later as "Our World". 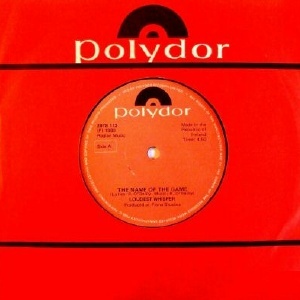 4 track promo only CD EP released to promote the box set. 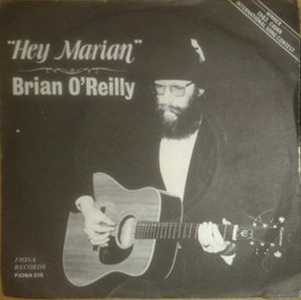 Solo release by Brian O'Reilly's son.